Sunlight steaming into the room woke me this morning. 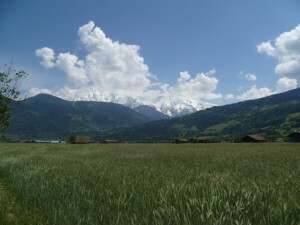 Fantastic views of Mt. 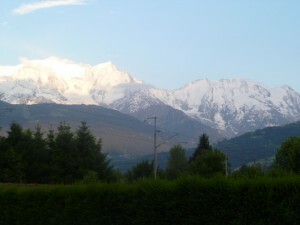 Blanc and other peaks of the Alps. I threw open the window. It was cool and crisp outside the very best walking weather. 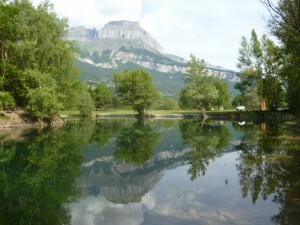 After a cup of coffee with Guylene on the patio (where we could enjoy the mountain view) I headed off for les 3 petits lacs, about 4 or 5 k away. 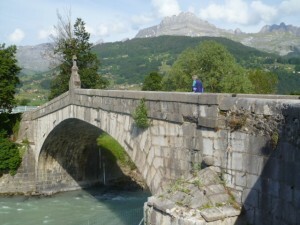 The path followed the Arve River, then crossed the 13c St. Martin bridge. The hamlet on the other side of river looked like it too had been dropped in from some previous century, there were no obvious signs of gentrification. I loved the bridge and the tiny settlement. En route I passed several classes of children lined two by two Madeline style (the smallest children holding hands with their partner) sheparded by a teacher, obviously out on some sort of nature excursion. Not far from the bridge I passed a private high school. Inspite of the clearly marked, covered smoking area, most of the smokers crowded on the narrow sidewalk just outside the school gates. The lakes string through a lightly wooded area. A lakes go they are rather non-descript but they beautifully relect the surrounding mountains. The only waterfowl at the lake were slightly larger relatives of the American coot. They too swim with the bobbing head motion that reminds me of swimming chickens. Lots of smaller birds chatting up a racket in the trees. One lovely dove, something like a dramatically striped black capped chikadee. Perhaps I saw a goldfinch – glimpse of yellow and black. Yesterday I saw a dramatic flash of yellow and red, dove sized. Not a clue as to what it was. It has been warm enough that I decided I needed another fast drying Tshirt, so after lunch with Alain I headed off to the Quechua store about 6 k away. Guylene had verbally given me alternative directions past another lake then on a road between the railroad tracks and beautiful fields of wheat and lots of wild flowers. 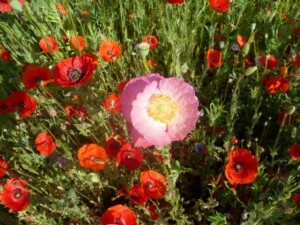 Flander’s poppies, clover, buttercup, daisies, goldenrod, scabia – and many I don’t know buy name. I thought some spikey purple flowers were lupin, but upon closer examination…. Maybe some type of beebalm, the bees sure liked it! 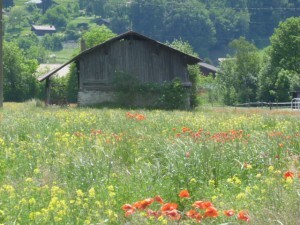 The wind was fairly strong and the silver green wheat heads rippled, tinted here and there by the wildflowers. The snowy peaks of Mt. Blanc and les aiguilles provided a stunning back drop.